The Academy announced election results for its Board of Governors and promoted from within Andy Horn to the new position of COO. The Academy announced election results for its Board of Governors and promoted from within Andy Horn to the new position of CFO. In addition, seven incumbents were reelected and three other motion picture professionals will return to the Board after a time away. Returning to the Board after a hiatus are Michael Mann, Directors; Arthur Hamilton, Music; and Kathleen Kennedy, Producers. Mann previously served from 2000 to 2006. Hamilton most recently served from 2008 to 2011; he has served a total of 33 years. Kennedy was on the Board from 1994 to 1997 and again from 2002 to 2011. The reelected governors are Tom Hanks, Actors; Jim Bissell, Designers; Rob Epstein, Documentary; Mark Goldblatt, Film Editors; Leonard Engelman, Makeup Artists and Hairstylists; Rob Friedman, Public Relations; and Bill Kroyer, Short Films and Feature Animation. Fourteen of the Academy’s 15 branches are represented by three governors, who may serve up to three consecutive three-year terms. Terms are staggered so that each branch elects or reelects one governor each year. The Makeup Artists and Hairstylists Branch is represented by a single governor. At the end of 2011, Directors Branch governor Paul Mazursky stepped down from his seat on the Board. Lisa Cholodenko was elected to complete the two years remaining on Mr. Mazursky’s term and Michael Mann was elected to a new three-year term. Governors who were not up for reelection and who continue on the Board are Ed Begley, Jr. and Annette Bening, Actors Branch; John Bailey and Richard Crudo, Cinematographers; Rosemary Brandenburg and Jeffrey Kurland, Designers; Kathryn Bigelow, Directors; Michael Apted and Michael Moore, Documentary; Jim Gianopulos and Robert Rehme, Executives; Anne V. Coates and Michael Tronick, Film Editors; Charles Fox and David L. Newman, Music; Gale Anne Hurd and Hawk Koch, Producers; Cheryl Boone Isaacs and Marvin Levy, Public Relations; Jon Bloom and John Lasseter, Short Films and Feature Animation; Curt Behlmer and Don Hall, Sound; Craig Barron and Richard Edlund, Visual Effects; and Frank Pierson and Phil Robinson, Writers. Andy Horn was promoted to the Academy’s newly created position of Chief Financial Officer, Academy CEO Dawn Hudson announced Wednesday, July 18. Horn will report directly to Hudson. Since joining the Academy in 2001 as Controller, Horn has managed the year-round, day-to-day financial activities of the organization. For the Oscars, he helps devise the budget, review expenditures and negotiate contracts with ABC and the CIM Group, owners of the Hollywood & Highland Center. The creation of the CFO position was made possible by a change to the Academy’s bylaws and approved by the Board of Governors at its most recent meeting. 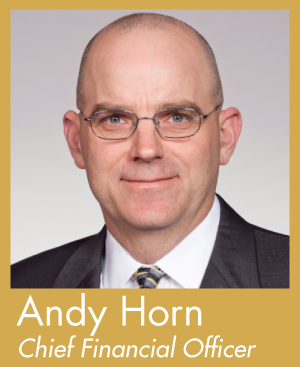 Horn is now the most senior financial executive at the non-profit organization. Before joining the Academy staff, Horn spent seven years at PricewaterhouseCoopers, overseeing audits of a number of large entertainment industry clients, including the Academy.